Realizing that your outdoor patio or deck is consistently under-utilized can be a frustrating thing. You know that it should be valuable amenity, and yet, it’s failing to draw interest from your clientele. When faced with this challenge, many property owners begin considering a patio renovation to enclose the space and make it more enticing. Before you start looking at financing for such a major undertaking, there are other options to explore, such as retractable roof structures, “interior” design upgrades, and climate control solutions. Incorporating the right solutions begins with identifying your main challenges – visual appeal & drawing attention, comfort & weather considerations, or overall style & alignment with the indoor ambiance. Humans are naturally drawn to spaces that are aesthetically appealing, and concrete patios simply don’t captivate the eye. If you believe your challenge stems from a lack of visual appeal, then it’s time to revitalize the patio’s design. Start by upgrading cheap furniture to high-quality pieces that are beautiful, sturdy, and functional. Add pops of accent color with outdoor cushions and pillows to draw attention from inside. If the flooring of your patio is unattractive, durable outdoor rugs can deliver a very cost-effective transformation. Once you’ve reevaluated the “interior” design of the deck or patio, consider the impact a retractable roof structure would offer – with its modern design and clean lines. Retractable roof structures help to visually define patios as highly usable and valuable spaces – softening the all-too-common industrial look of commercial patios with top-quality billowing fabrics. Guests aren’t going to be interested in your outdoor space if they fear that they’ll be uncomfortable. If you believe your challenge is a result of the weather, then it’s time to upgrade the comfort solutions you’re offering. Retractable roof structures provide shade-on-demand for hot climates – naturally cooling the space by 10-200. When paired with strategically placed fans, your guests can be cool even on the hottest days. For cooler climates, retractable roof structures can transform cold evenings into cozy experiences by trapping more of the valuable heat coming from your outdoor heating units. Remember – to ensure your guests’ comfort, you don’t need to build a permanent roof structure or enclosure. There are better options. Especially for brands that are built on luxury and elegance, deck or patio seating can feel like a downgrade from the interior of your property. If you feel like this is the challenge that’s standing in your way, then it’s time to add class and style – but in a cost-effective way. We’ve already discussed the necessary furniture upgrades to make the space visually appealing and comfortable. However, to create a superior outdoor experience, you should also consider top-quality retractable roof structures, premium lighting, and other ambiance improvements, such as fire pits and sound systems. 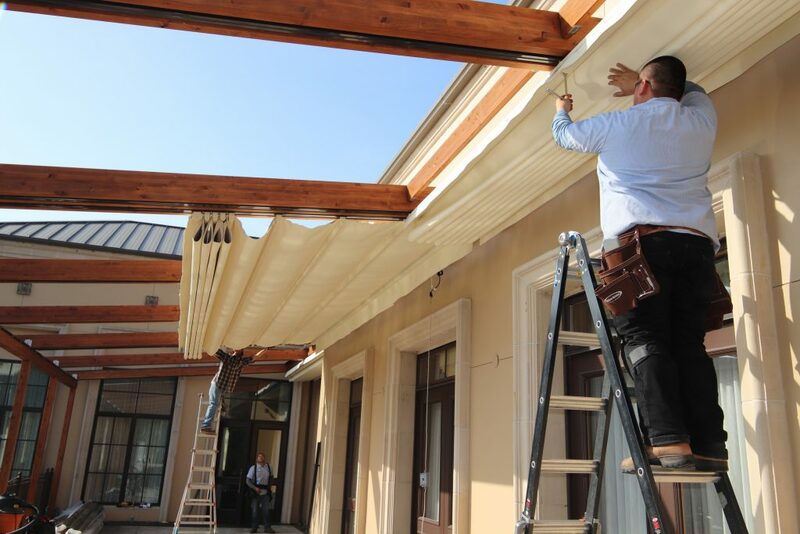 Every business has limited resources when it comes to property improvements. Instead of wasting money on a full-scale renovation to enclose your patio or build a permanent roof cover, it’s time to look at the cost-effective solution of a retractable roof structure. Then, you can put your savings to work – making all the other upgrades you desire. Are Retractable Roof Structures Right for Your Commercial Property?